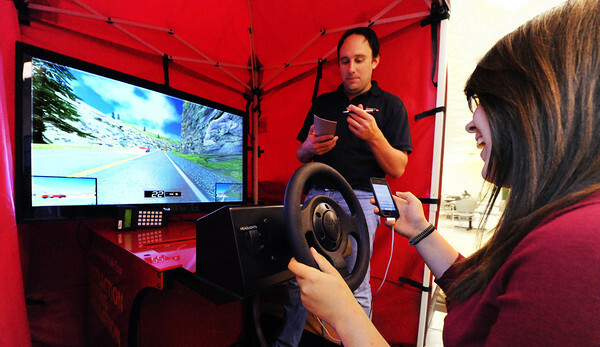 Bethany Mullins, a senior music education major, attempts to text and drive during a simulation as C.J. Rich, speaker with the Save A Life Tour, writes her a ticket for distracted driving Thursday afternoon, Oct. 17, 2013, near the cafeteria in MSSU's Billingsly Student Center. The Save A Life Tour is focused on distracted driving and is sponsored by Edu-Tainment by Kramer International. Rich said the driving simulation lasts about 4 minutes unless the driver crashes earlier.